Even when water began rushing in under their front doors, several residents in Orange, Texas defied calls to evacuate, including Lonnie and Missy Givens, who stayed home despite mega-storm Harvey turning their community upside down. The couple simply refused to leave the house they have spent much of their married life in, while hundreds and perhaps thousands of their neighbors fled raging flood waters or were rescued by boat or helicopter crews. 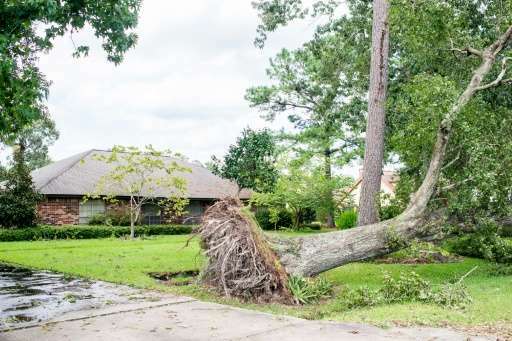 On Thursday, as they surveyed the damage from lawn chairs in the bed of their pickup truck, Missy expressed shock at the power of such a "freaky" storm, the likes of which she has never experienced in her town until now. "I've never seen a storm do that," she said of the natural disaster that is believed to have killed more than 30 people. "When it turned into a big deal, I panicked a little bit." Water was four inches deep in her game room—not nearly as bad as some homes that were inundated with several feet of water just a few blocks away. Much of the flooding receded quickly from Orange, but the aftermath of the chaos was everywhere. Huge uprooted trees lay across roadways. Power lines were down. National Guard teams rolled through the town's neighborhoods Thursday, plucking people from flooded roadways. Helicopters buzzed overhead, occasionally touching down to conduct rescue operations. Some were seen refuelling in the air. "They had airlifts with helicopters, truckfuls and boatfuls of people," said Rachel Wilson, 29, who also refused to leave but acknowledged her family's good fortune when the floodwaters, nearly waist deep on her road, stopped just inches below her front door. A quick-thinking Wilson said she found a boat driver in the middle of the storm and convinced him to rescue her friends Greg Castellanos and Christie Fontenont, who waded through chest-deep water before reaching the boat. "We're bayou, baby, so we can handle it," Castellanos, his chest a maze of tattoos, said with a grin. After two sleepless nights, the two families enjoyed a moment of relief and respite Thursday, sipping Bud Lights on the Wilsons' porch and recalling their ordeal. A mile away, a small team continued making boat rescues, plucking the appropriately named Harvey Dubois and wife Lola from their home as floodwaters lapped at the door. "I'm grateful, but we didn't want to leave," Harvey, 76, said. They had little water and food, and no power. Lola Dubois was scared. When rescuers knocked on the door and saw their situation, they demanded the elderly couple get in the boat. "We just felt it in our hearts to come help," said Heather Lisotta, shortly after she ushered the Dubois into a pickup truck for transport to a shelter. Lisotta, 28, said she was part of an unofficial group known as the 2017 Rescue Rangers of Southwest Louisiana. While some Orange residents refused evacuation, many were grateful for the rescue. 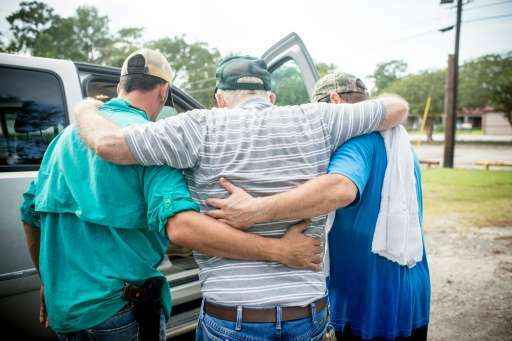 Lisotta, a homemaker who said she had never engaged in rescue operations before, estimated that she and her two friends, with just two boats, rescued between 100 and 250 people in the two days since floodwaters rose in Orange. "A lot of them were starting to believe nobody was going to come and help them," she said.